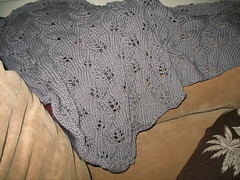 The Tuscany Shawl has been completed! 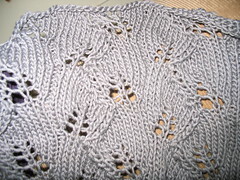 I was worried about doing a pointy shawl from the bottom up, a way that seems designed to taunt victims of starter-itis, but it was fun and easy and relaxing. Having the wrong side rows be simple read your knitting rows, made this a great multi-tasking knit. I ended up binding of halfway through the final pattern repeat because I was paranoid the last ball was dwindling quickly. It's still plenty long, and I'm sure when I block it it'll bloom a smidge more. I had the mercerized cotton on hand (right gauge and everything, it seemed meant) but would love to try this again with the silk in a bolder color, since I think the silk will have a really gorgeous drape. Needles: Denise Interchangeables #6 - With the pink cording! You didn't have #3 on the No sheep KAL. That is my favorite Pic. Thank you again for the Silk alternative. 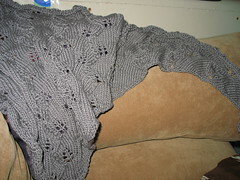 This might really give me the push to put it on my knit list of items I want to do. Gorgeous!!!! Hope you enjoy wearing it!